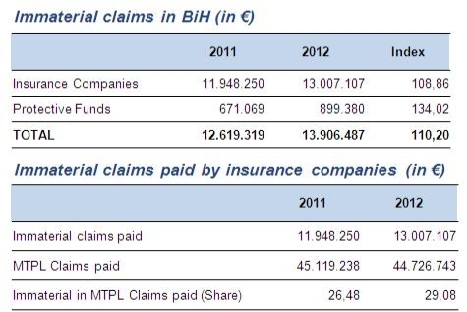 In 2012, the claims paid by the BiH insurers on the MTPL insurance class totalized EUR 44.73 million, of which EUR 13 million (the equivalent of 29%) were related to non-material claims. For the same period, the Protective Fund paid EUR 0.9 million in non-material claims. At the moment, the MTPL market in BiH is not liberalized, but the World Bank has initiated a project concerning the liberalization of the MTPL insurance market in Bosnia and Herzegovina. The initiative’s effects will start to be visible on the market during the next months. “One of the project’s main objectives is the development of the regulatory framework and the technical tools necessary for an actuarially solid setting of premium rates and technical reserves for MTPL insurance”, declared Samir OMERHODZIC, Director, Insurance Agency of Bosnia and Herzegovina. At the same time, the project aims to ensure that the proposed regulatory framework for the MTPL insurance market is “in compliance with the EU MPTL insurance legislation, specifically with the commitments of Stabilization and Association Agreement with European Union, and that it properly accounts for the best international practices in liberalizing the MTPL market”, Samir OMERHODZIC concluded.